It's sure sounding like the Toronto Maple Leafs and Detroit Red Wing will play in next season's Winter Classic. ESPN says they'll play at Michigan Stadium in Ann Arbor. Of course, as a participant in the Winter Classic, the Leafs will also be featured on HBO's 24/7. That's what has me most excited. I love 24/7, and I can't wait to see my favourite team profiled. This will be awesome. And yes, I'm aware our 4-game winning streak only became possible when I fled the country for a bit. I'm back now, so if we lose tonight in Buffalo, I'll admit that I've been single handedly holding us back my entire lifetime. Can't wait! 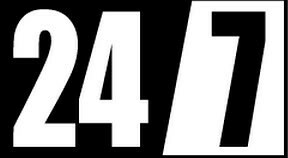 I love 24/7....wish it was more than 4 episodes! Mike- you can not even make out the zamboni from half the seats in that stadium, never mind trying to see the puck or the players. Well, my Habs are in a slump and they made another dumb trade trading Cammaleri. That was dumb. They better not make any more dumb trades. Go Habs. Sure, I left and we won 4 straight and I returned and we lost, but that's just a coincidence. I can't possibly have such power. Coincidence. I'll bet we win tonight. You're like a degenerate gambler who thinks they can get out of the hole by betting just one more $20. Stop.